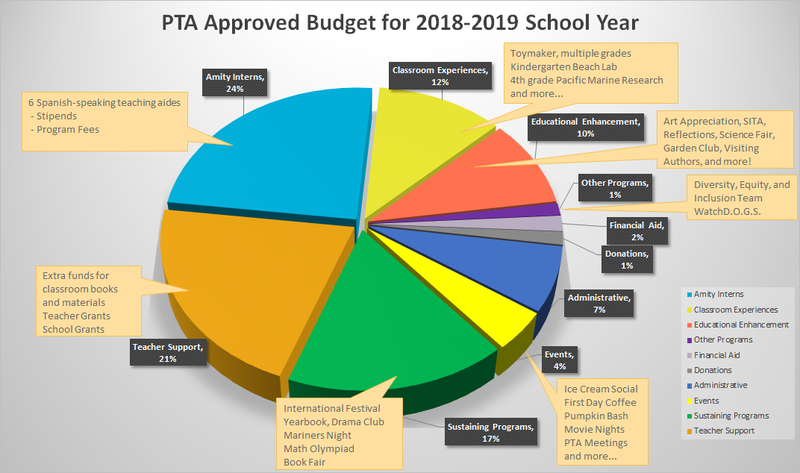 The PTA Board from 2017-2018 put together the budget for the 2018-2019 school year which was voted on and approved by the PTA General Membership Meeting in June 2018. Below is a snapshot of how we have budgeted the PTA funds that were raised for this school year. The above budget was approved in June 2018 for the 2018-2019 school year. Slight modifications were voted and approved at the September 26, 2018 PTA General Membership Meeting. Our Puesta del Sol Community is welcome at all our PTA meetings and PTA members are entitled to a voice and a vote at these meetings. Please join us! If you would like a more detailed accounting of our PTA budget or spending, you must be a PTA member and you may send your request to our PTA Treasurer at Treasurer@puestadelsolpta.org. If you have questions about the budget whether you are a member or not, you may direct your question to the PTA Treasurer or the PTA President or any PTA board member and we will do our best to answer you. PTA members may review past Meeting Minutes from our board and general membership meetings to illuminate some of the PTA’s choices on budgeting and spending. Your donation to support our PTA programs is always welcome! Donate today!